The woman I admired my whole life. She truly was an amazing and mesmerizing personality. Born in lucknow in the year 1931, she acquired her BA degree from THE WOMAN'S ACADEMY LUCKNOW, and later on completed her B.Ed from KARACHI UNIVERSITY. As she really adored children she decided to do something for them and opened up a school for them named MADAM MONTESSORI SCHOOL in 1966. On 20th January 2011 she passed away but her services to this nation will live on. She was a true patriot and loved Pakistan. There will be a Parent/Teacher meeting of Reception and Junior both campuses on Saturday 20th April, 2019 between 9:00 am. – 11:00 am. The Progress report of the children will be handed over to their respective parents. The children of Senior section Campus-II will be photographed on Wednesday 27th March, 2019 during school hours, send your child well dressed. We are having Pea Shelling Activity in Reception & Mont on Wednesday 06, March 2019. Kindly send 250 grams (1 Pao) of Peas along with your child. We are having Pea Shelling Activity on Tuesday, 5th March 2019 in Reception. Kindly send 250 grams (1 Pao) of Peas along with your child. MCDC invites you to be with us on Parents Day which we happily present to you on Saturday, 16th February 2019. Note: Only one parent is allowed. Siblings are strictly not allowed. Children need to be present (dressed) at school sharp by 9:00 a.m.
We are having Grandparent's Day tomorrow Saturday,February 2, 2019 at MCDC Campus I. Join us to mark this memorable celebration. Note:Children need to be present at school sharp by 9:00 am. Only one Grandparent is allowed. "Have an enjoyable winter vacation"
There will be an “Annual Sports Day” for Junior and Senior on Saturday, 15th December, 2018 at Campus 11. Kindly send your child in white outfit and canvas sports shoes. Timings: 09:00 a.m. till 01:00 p.m. Note: Children need to be present at school sharp by 09:00 a.m. Your child will be photographed on Tuesday 11th December, 2018 during school hours, send your child well dressed. There will be an “Annual Sports Day” on Saturday, 8th December, 2018 for Junior and Senior at campus (I). There will be a Parent/Teacher meeting and Distribution of Progress Sheet of Reception, Junior and Senior classes on Saturday, 08th December 2018 at campus (II). You need to bring the following documents along with you to collect registration form. Note: The tokens will be issued from 7:30 a.m. Note: Bring original birth certificate at the time of issuance of form. A Photocopy of birth certificate and 2 passport size photographs must be attached to the application form. The interview date will be given to you the same day you submit the form. The age of child should not be less than 2 ½ year in April 2019. The child should be mentally and physically prepared to come to school, should be toilet trained and healthy. There will be a Parent Teacher meeting and Distribution of Progress Sheet of Reception, Junior and Senior classes on Saturday, 01st December 2018. Timings: 09:00 a.m. – 11:00 a.m.
Freehand Painting Activity will be held in Reception-Campus 2 today 27-November-18 Tuesday. Freehand Painting Activity will be held in Reception-Campus 1 tomorrow 27-November-18 Tuesday. We are having traffic light activity tomorrow 7 november'18 in junior Campus II only. In this regard our students have prepared a short display to enlighten the importance of Traffic rules. Parents are requested to be present in school sharp at 12:30 pm. The scheduled English paper which was to be held on Monday 05th November 2018 will now be conducted on Tuesday 13th November 2018. The following papers will be carried out as per the given schedule. Due to the uncertain law and order situation for the safety of students MCDC will remain closed tomorrow 2nd November 2018. Due to the uncertain law and order situation for the safety of students MCDC will remain closed tomorrow 1st November 2018. As per Government announcement MCDC/School will remain closed on Wednesday October 24, 2018 on account of Urs of Shah Abdul Latif Bhitai. A Parent Teacher Meeting has been scheduled on Monday, October 15, 2018. The school will remain closed for students. You have been allotted a time slot to discuss your child progress. Please come accordingly. Children are not allowed. Timings: 09:00 a.m. - 11:00 a.m.
Kindly send back the money box tomorrow Tuesday 9th October 2018, so the savings of your child should be distributed among the needy. We are having Show and Tell Activity on Wednesday 3rd October 2018. This Activity helps our child to build their social, emotional and language skills. The students are informed to bring their favourite toy or any object of their choice & tell few lines about it. We are having Show & Tell Activity on Tuesday 2nd Oct’ 2018. This Activity helps our child to build their social, emotional & language skills. The students are informed to bring their favourite toy or any object of their choice & tell few lines about it. We are having (clay) pot painting activity tomorrow Thursday 27th, Sept’ 18. Kindly send your child with a money box (Gulak). Colour Activity for Reception will be held tomorrow Wednesday 26-September-2018. Colour Activity for Reception & Mont (Campus-I) will be held tomorrow Tuesday 25-September-2018. MCDC is celebrating Defence day on 6th September'18 in memory to those who embraced martyrdom. 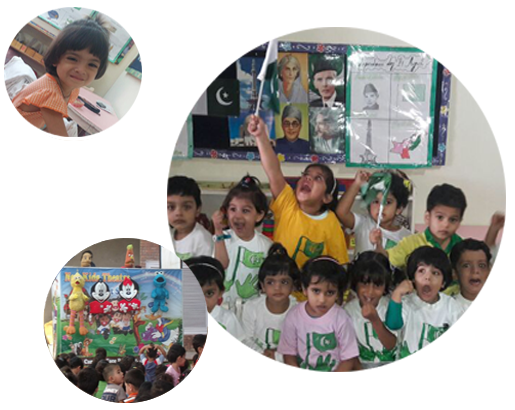 Any Parent who is interested can dress their child in uniform representing Armed Forces of Pakistan. Kindly send your child in kurta shalwar with scarf/dupatta for girls and white cap for boys along with one tasbeeh for (Tasbeeh Activity) on Friday 17th August, 2018. The Centre will remain closed on Wednesday, 15th August, 2018. We are having conduct meeting for Reception & Junior on Saturday, 11th August, 2018 from 9:30 a.m to 10:30 a.m. Note: Only one parent is requested to come and children are strictly not allowed. Parents should be seated sharp by 9:00 a.m & do bring a notepad and pen to jot down the important points. As per the Government announcement, the school will re-open on Wednesday 1st August 2018. As per government announcement, the SUMMER VACATION will start from Monday, May 14, 2018 to Monday, July 16, 2018. The school will re-open on Tuesday, July 17, 2018 Insha’ Allah. No fee will be accepted after above mentioned date. M. C. D. C. School office shall remain open during vacation on every Monday from (09:00 a.m – 11:00 a.m.) for parents’ enquiry. We wish all of you a very blessed month of RAMADAN & Happy Eid! Parents are requested to note the following schedule. 1. The Centre will remain closed for summer vacation w.e.f. Monday, 14th May, 2018 till Monday, 16th July, 2018. It will re-open on Tuesday, 17th July, 2018. 2. All dues must be cleared before Wednesday, 16th May, 2018. 3. No fee will be accepted after above mentioned date. 4. Kindly submit the Summer Vacation Home work for both Junior & Senior in the office from Saturday, 14th July 2018 till Monday, 16th July 2018 in between (09:00 a.m – 11:00 a.m.) after that it will not be accepted. 5. The office will remain open on every Monday between (09:00 a.m – 11:00 a.m.) for parents’ enquiry. We take this opportunity to wish all the parents a very blessed Ramadan & Eid-ul-Fitar. We are having Bubble Making Activity on Thursday 10th May, 2018. Kindly send one Bubble making tool, Bubble making liquid and a blower along with your child. There will be a Juice making activity on Wednesday, 09th May, 2018. Kindly send 500 ml water bottle and small sachet of Tang along with your child. We are having Water Gun Activity on Wednesday 9th May, 2018. Kindly send one squirt gun (water gun) along with your child. send 1 packet of play dough (plasticine) along with your child. The Centre & M. C. D. C. Schooling System will remain closed on Tuesday 1st May, 2018 and Wednesday 2nd May, 2018 on account of Labour Day and Shab-e-Barat respectively. Death anniversary of Z. A. Bhutto. As per Government accouncement M.C.D.C will remain closed on Wednesday 4th April 2018 on account of Death anniversary of Z. A. Bhutto. There will be a Parent/Teacher meeting of Reception and Junior on Thursday 22nd March, 2018 between 9:00 am – 11:00 am. Promotion of Junior to Senior on Thursday 29th March, 2018 and of Reception to Junior on Friday 30th, March, 2018. There will be a Parent/Teacher meeting of Reception and Junior on Wednesday 21st March, 2018 between 9:00 am – 11:00 am. The photographs of the children taken on Sports Day (Campus-II) for Junior and Senior have been put up on the display board. Kindly book your copy last by Wednesday 07th March, 2018. For your convenience MCDC has launched its mobile app so that you can get all the important notifications on time. This mobile app is available on Play Store and can be downloaded by any Android Phone. To login, you have to use your mobile number which is registered with us against your child. If you find that your number is not registered or you are unable to login you can contact admin and update your mobile number. To download the app, go to Play Store and Type MCDC in search box and click search. We have app for each of our campus so please download the relevant campus app. There will be a Parent teacher meeting and Distribution of Progress Report on 9 Dec'17, Saturday for Reception, Junior and Senior class. A Photocopy of birth certificate, 1 “1/1” photograph and 1 passport size photograph must be attached to the application form. The interview date will be given to you the same day you submit the form. The age of child should not be less than 2 ½ year in April 2018. The child should be mentally and physically prepared to come to school, should be toilet trained and healthy. The M. C. D. C. Schooling System is accepting registrations for new admissions to Class-1 and Classes-4 and 5 (Limited Seats) for the Academic session of 2018-2019. The registration forms will be available from Tuesday, January, 09, 2018 to Thursday, January 11, 2018 from 9:00 a.m to 12:00 noon. Please note that application for aptitude test done does not in any way confirm your child’s admission. Completely filled forms shall be submitted from Thursday, January 11, 2018 to Saturday, January 13, 2018. Required Documents: You need to bring the following documents along with you to collect registration form. Welcome to MONTESSORI CHILD DEVELOPMENT CENTER. We have launched our new website, Feedbacks are welcomed.